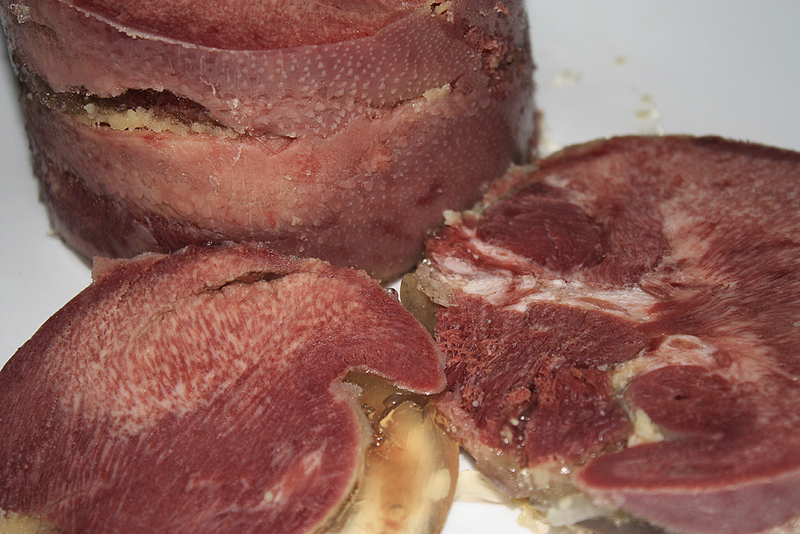 My mother used to serve us pressed tongue quite often and it was one of my many favourites. I had not had it for many years until on my recent trip to NZ, I found some in the deli section of a supermarket. Then last week I was given a salted tongue (thanks Jane), mainly because Jane didn’t know anyone else likely to eat it. I excitedly googled recipes, and started into it. 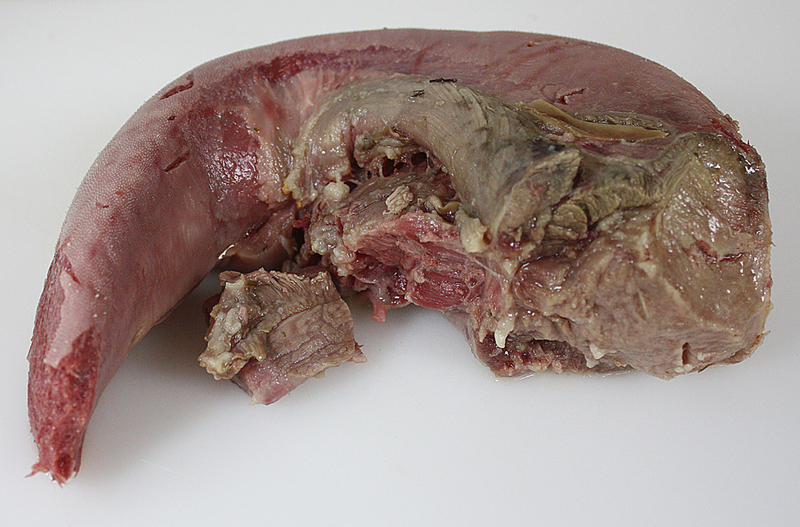 Tongue is perhaps not the most attractive cut of meat, maybe that’s why it isn’t more popular. First off I soaked it overnight in the fridge to reduce excess salt. I then trimmed off the fat. Then it was into the slow cooker with a sliced onion, a clove of garlic and some thyme leaves, on high for 5 hours, until a sharp knife penetrated the tongue easily. 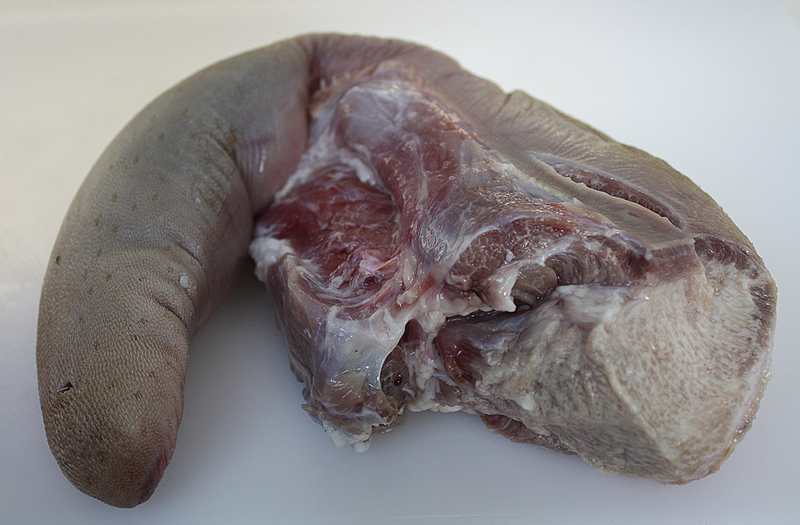 After letting it cool a bit, I skinned the tongue, which was very easy, the skin just peeled off. I used a plastic container as a tongue press. I cut the neck off the container to make straight sides, and the lid then fitted neatly inside to act as a press. I cut the tongue in half length ways and packed it into the press. I added a little gelatine to about 300 ml of the liquid from the slow cooker and poured some of it over the tongue, then pushed the lid in. I used a tin can to put pressure on the lid by jamming the press and can between two shelves in the fridge. The next day I just quickly warmed the outside of my press with hot water and the tongued popped out, and looked pretty good. 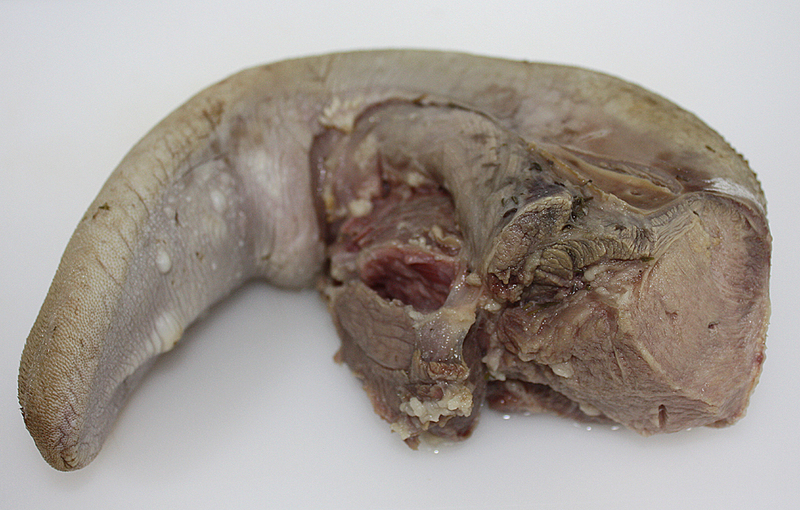 The sliced tongue was perhaps not quite as tender as it could be (but by no means tough, just didn’t quite melt in the mouth), with a taste very similar to corned meat. It isn’t quite the taste I remember, perhaps my mother didn’t use pickled tongues (something to try next time). Delicious for sandwiches, this will definitely be a regular at my place, even if I’m the only one who will eat it. 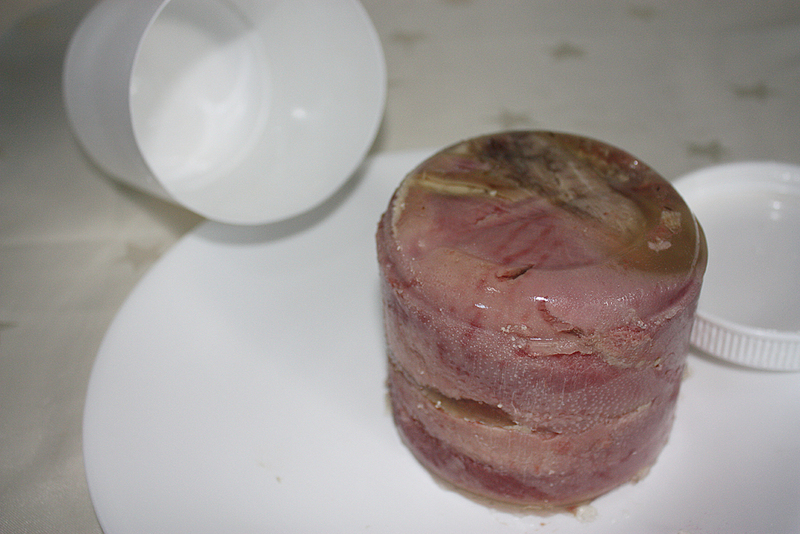 This entry was posted in Meat dishes and tagged beef, cooking, food, meat, offal, tongue. Bookmark the permalink. Well done Kevin…Mick is very impressed at what you did to his cows tongue….I don’t know that it will be on the menu here but now we know where to send it too. Your website is looking great by the way. I am sure I can speak for all your fans when I ask if u can reveal which sort of plastic container u recommend to use as a tongue press?